There are undoubtedly some trolling motor lines that offer nearly everything that an angler wants in a piece of equipment on their boat, and it is rare when a trolling motor of that caliber comes along with the number of options as the MotorGuide X5 bow mounted trolling motor. It has become one of the most popular trolling motors on the market, and in this article, we will take a look at the characteristics of this trolling motor that makes it so. We will break down the features, the options, and the performance of the motor on the water for you. While we at Fishing Tech give the X5 trolling motor an A rating, we are more concerned with providing you with an unbiased review of this motor so that you can make the best possible choice for your situation. ATTWOOD/MOTORGUIDE 940500170 Bow Mount X5-70Fw Fb / 24V Boating Equipment, 45"
In this section, we will take a look at all of the features that are available on the MotorGuide X5 trolling motor. We will take a closer look at how these various features translate to the motor’s functionality on the water in the review section. This composite foot pedal is a big leap in pedal design. The high impact material is one of the best when it comes to resisting flex in the pedal which is going to hinder response and sensitivity over time. With this pedal, you can adjust the angle of the toe and heel platform and have full control over the motor’s operation. An LED-lit directional indicator sits on top of the control head and gives you quick access to the direction of the motor head. The LED lights allow this feature to be useful at all times of the day and during night fishing trips. All of the foot operated models of the X5 use the 2-Blade Weedless Design. These props are quite and do not draw a lot of power from the battery. It has a unique blade design that allows the prop to slip through underwater vegetation without bogging down. All of the X5 trolling motors feature a breakaway mechanism on the shaft that acts as a bow guard. If you do happen to run up on an unmovable object below the surface, the breakaway mechanism engages, releasing the shaft from its normal sturdy position. The VRS steering is the big leap in technology that the X5 boasts. This steering technology greatly reduces the amount of torque feedback which eliminates a lot of overcompensation and unpredictable motor movements that is often seen in foot control trolling motors. Paired with the pull-pull cable system and the foot pedal, you get an extremely sensitive and easily controllable motor that is hard to match with other motors on the market. The new shaft design uses two columns. The outer column is a stainless steel rod that is incredibly tough and corrosion resistant, while the inner column, that is located beneath the water, still gives you a lot of strength while still providing a little bend to resist breaking on impact and warping over time. The shaft is also covered by a lifetime guarantee. The X5 mount features some major design changes compared to older models. It features an extruding aircraft grade aluminum arm with porting that helps cut down on weight while not sacrificing strength. It also features a wider base for a better point of support and uses composite bushings and pins at key areas of wear to reduce noise and increase the mounts longevity. The new mounting bracket for the X5 is crafted from aircraft grade aluminum. This means a lightweight but incredibly strong foundation for your trolling motor. All of the X5 models utilize MotorGuide’s digital variable speed control. This technology extends beyond allowing you to dial in the exact speed that you want to be running, which is a big enough reason to like this style. This technology also results in more efficient electronics that run cooler and lose less energy in the form of heat, which greatly improves the run time of the motor. There are quite a few model options when it comes to the X5 trolling motor. While the table will break down the major differences between the different model options, we will also take a look at the features that are shared by all models. We do want to point out here that there is a single hand operated X5 model that is available and want to briefly outline some of the specs for this trolling motor. The hand operated model uses several of the same features seen with the foot operated model including the mount, shaft design, and digital speed control and VRS steering. Obviously, this motor uses a hand tiller for control that is extendable up to six inches. The hand operated model does not have integrated sonar or a directional indicator as the foot models, and the prop is the 3-blade Machete design. The single hand operated model that is still in production has a peak thrust of 80lbs with a 50inch shaft length and requires a single 24V battery. The major factors that you need to take into account when looking at the X5 foot controlled models are the thrust metrics as well as the shaft length which is going to depend a lot on your boat and the type of water you are going to be navigating. The other major choice you will have to make is whether you want the integrated sonar. There is a model with each thrust option that comes with the integrated sonar or does not. There are a lot of similar features that span across the entire range of models. All models use digital variable speed control, they all have a lighted directional indicator, they all feature the dual cable/VRS steering technology, all have the newly designed composite shaft, and all feature the 2-blade weedless propeller. All of the models listed above also have the newly designed X5 mount and bracket. Perhaps one of the most important features of a trolling motor is how durable it is and what its lifespan looks like. When we look at the MotorGuide X5, the first feature that jumps out at us regarding durability is the tough X5 mounting bracket and the composite/stainless steel shaft. The mounting bracket takes up quite a bit of room, but it is tough aircraft grade aluminum that can take some abuse. It is also stable enough that when running at high speeds you are not going to see or feel unwanted movement in the motor. The shaft used for these trolling motors have an interesting design where it features two columns. An inner column is a composite shaft and it what is encountered in the water to help protect from shaft breakage, and the outer column is a stainless steel shaft that provides extra support near the control head and mounting bracket. On top of this, the X5 features a breakaway mechanism that is going to protect the bow of the boat in the case of impact. These features provide an a workhorse of a trolling motor. Some concerns that a lot of users have and one that we have come across is the durability of the control head that is a lower grade composite material. Its durability has been called into question, but in normal usage scenarios, it shouldn't be an issue. When using a trolling motor for fishing purposes, which we assume most of you are, you also want a quiet trolling motor. This includes quietness of the motor when running, especially vibrations which fish can sense incredibly well, but also quietness when stowing and deploying the motor. The X5 bracket does a wonderful job at reducing vibration caused by running the motor. Even with a lot of aluminum and other metal in the design, it is incredibly quiet. Again, this is essential when fishing shallow water. While we are on the topic of the bracket, we like the extruded aluminum arm. It provides incredible leverage that takes the muscle out of stowing and deploying. As for the motor, the X5 has had a lot of new design features including MotorGuide’s Digital Power Management. With more efficient electronics and bearing systems, friction is cut down greatly, and the motor runs much cooler. All of this leads to a quiet motor that stays quite for a long time. 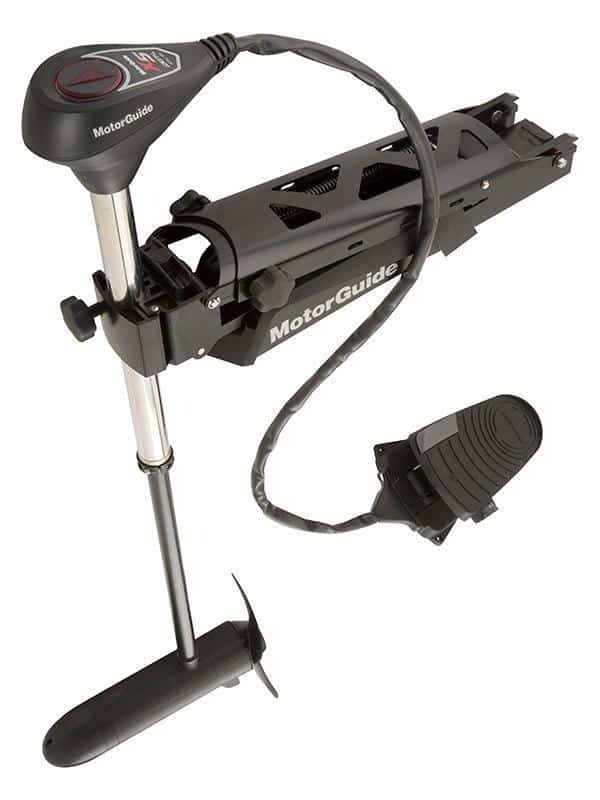 MotorGuide uses a dual cable that runs between the foot pedal and control head which helps eliminate slack which causes a delay in pedal manipulations and actual changes in the motor direction. They also use a technology called Variable Ratio Steering. What you need to know about this is that the steering for this model is incredibly sensitive. There is no torque, no slack or pause when handling the motor direction and speed, and it has incredible responsiveness. If you need fine control of your motor and boat, the X5 is one of the top options available. A lot of fishing where a trolling motor such as the X5 is needed is done in shallow waters where you are likely to encounter underwater structures. The VRS technology shines in these conditions where quick, and ultra-responsive turns are needed to avoid such obstacles. All models of the X5 bow mount trolling motor comes with digital variable speed control. When paired with the VRS steering, this motor performs incredibly well on the water. The X5 uses a composite "heel and toe" foot pedal that we like. It feels a little lighter than other pedals of similar design, but it doesn't feel like it is going to warp beneath your foot when controlling the motor. Where it does seem lighter, and this is going to be a personal preference once you have it on your boat, some might want to screw it onto the deck of the boat. You have full control of the motor through the foot pedal manual and continuous on buttons as well as the speed adjustment dial. There are a few other features of the X5 that we were not able to cover in the previous sections and want to touch on briefly now. The first feature is the integrated sonar option that you have with several models of the X5. If this is your first trolling motor or if you are having to replace an older model and are not attached to some other type of transducer and unit then having a transducer already integrated into the motor head is very useful. We also like the LED directional indicator that is large enough and bright enough to be easily seen at any time of day or night and is constantly reliable. A very similar trolling motor to the X5 is the Xi5. It shares a lot of the same characteristics as the X5 with the most obvious difference being the addition of a wireless foot pedal and the Pinpoint GPS software. It is a personal preference, but a lot of anglers like the dual cable system compared to a wireless foot pedal. If you just want a trolling motor similar to the X5 but in smaller sizes, the X3 is also an option for you. If you want to branch out from MotorGuide, Minn Kota’s Terrova bow mount trolling motor. The Terrova has thrust options similar to the X5 and also feature Minn Kota’s i-Pilot or i-Pilot link. It is a toss up in regards to precision steering, and there isn't a consensus on which line is better. The Terrova also has several lift assist features that make stowing and deploying effortless. Both feature props that can handle underwater vegetation with relative ease and both have the option for an integrated transducer. The Terrova also features a push to test battery meter that comes in handy. Serious anglers that are in need of a precise and reliable bow mount trolling motor should consider the X5. The steering technology on this trolling motor is tough to match, and its quietness combines to make this a formidable trolling motor in freshwater settings. The X5 has a few drawbacks and points of concern, such as the durability of the control head and the lightness of the foot pedal, but overall easily attains an A rating in our eyes.